Details. All those wonderful little things that make up the theme of your wedding. Pictured here are three of the staples…the wedding rings, the flowers and the wedding invitation. This simple yet elegant shot is the perfect opening page for any custom bound bridal wedding album. I believe that wedding details shots should show just that…detail. 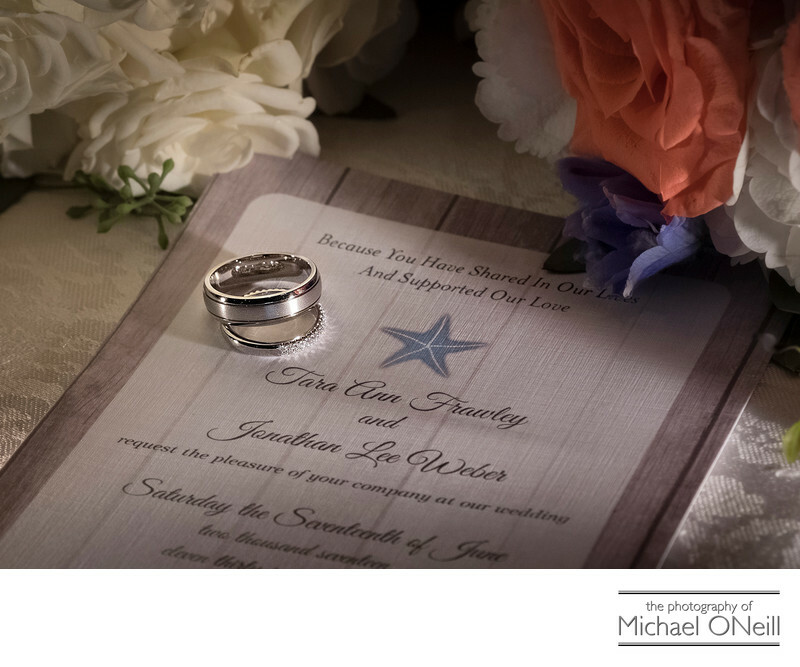 This shot does not disappoint as you can see every little nuance in the components from the texture of the paper that the invitations are printed on to the beautiful engraving on the groom’s ring to the sparkling diamonds on the bride’s wedding band. Good details shots require a special skill set by your wedding photographer. They must be proficient in close up macro photography and must be able to utilize specialized lighting hardware and techniques to bring out all of the subtle details and textures in the items being photographed. After the rings we went on to photograph the bride’s designer wedding dress, her bridal shoes, the jewelry she chose to accompany her wedding attire. floral bouquets, boutonniers, floral centerpieces, stemware, wedding favors, the wedding cake and the cake topper, special signs, champagne glasses, gift boxes, menus, etc, etc etc. All of these little items add up in a big way to define the theme and feel of your special day. Make sure your professional wedding photographer devotes some time and energy in creating lasting photographic memories of all these items.